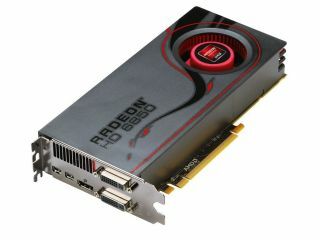 AMD has finally given us the green light to talk about its Radeon HD 6850 and Radeon HD 6870 cards. Expect a raft of card supplier announcements over the coming days. An AMD Radeon HD 6900 variant will debut in September - that's all we're allowed to say about that one at the moment. The new HD 6000 chips are the first to be fully branded under the AMD name rather than ATI, the former graphics giant now folded into AMD. They're the first second generation DirectX 11 silicon to hit the market and they will once again lay down the gauntlet for competitor Nvidia. AMD says the new cards will "win at the sweet spot" but our initial testing hasn't been overwhelmingly positive and we'll bring you full reviews as soon as we can. The AMD Radeon HD 6870 has 2 Teraflops of compute power with a core clock of 900MHz, 1120 stream processors and 1GB of GDDR5. Naturally, it will need two six-pin PCI Express power connectors. The AMD Radeon HD 6850 takes this down a notch – compute power of 1.5 Teraflops, 775Mhz core clock, 960 stream processors and a single six-pin power connector. Power consumption remains pretty high – although the 6870 as a 19 watt idle consumption, maxing it out will result in a 151 watt power draw. The 6850's figures are 19 watts and 127 watts respectively. HDMI 1.4a is supported, while high end cards in the line will be able to support up to 6 monitors through HDMI, DVI and mini Display Port. AMD says it has shipped over 25 million DirectX 11-capable graphics units so far.